Primary impairments from an upper motor neuron lesion (UMNL) are usually due to the disruption of supraspinal control of descending pathways that control excitatory and inhibitory influences on proprioceptive, cutaneous and nociceptive spinal reflexes. Corticorecticular Fibres form the Corticoreticular Spinal Tract. 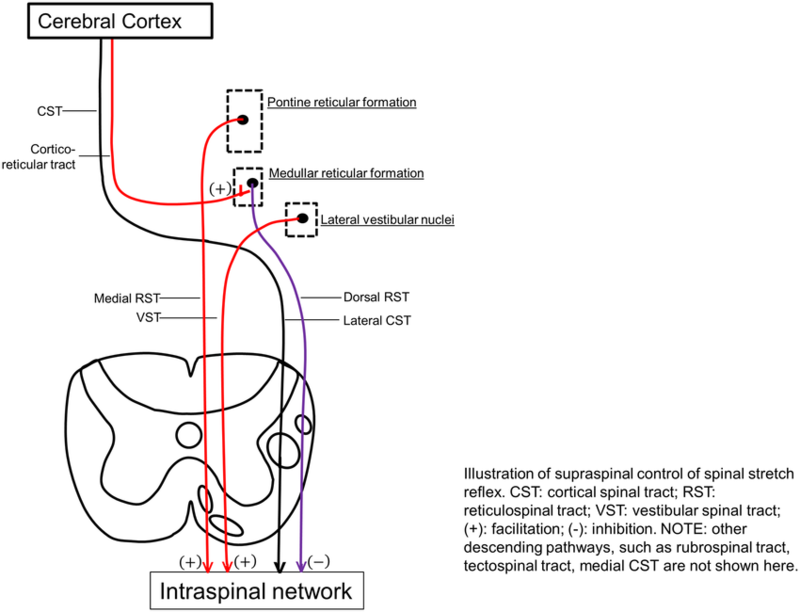 These tracts travel with, but are separate from, the Corticospinal Tract, and is responsible for the facilitation of the inhibitory area within the medulla called the ventromedial reticular formation. Here, the Dorsal Reticulospinal Tract originates, which is responsible for an inhibitory action on both the stretch and flexor reflexes. The bulbopontine tegmentum gives rise to the Medial Reticulospinal Tract and, acting weakly with the Vestibulospinal Tract, is excitatory to both stretch and extensor reflexes and like the Dorsal Reticulospinal Tract, is also inhibitory to the flexor reflexes. Both the inhibitory system (Corticospinal Tract and Dorsoreticulospinal Tract) and excitatory systems (Medial Reticulospinal and Vestibulospinal Tract) are in dynamic balance and therefore the inhibition to the spinal cord is easily adjusted according to demand. Although the Corticospinal Tract has an inhibitory influence on stretch and flexor reflex, the main inhibitory system produced by the Dorsal Reticulospinal Tract remains intact and therefore the balance of excitatory and inhibitory influences are maintained. Leads to interruption of both the Corticospinal Tract and Corticoreticular Tract pathways that are responsible for the inhibitory response and some loss of inhibition to stretch and flexor stretches. The excitatory systems from both the Medial Reticulospinal and Vestibulospinal Tract are more dominant which leads to the facilitation of extensor and stretch reflexes but inhibition of flexors. Signs and symptoms will vary dependant on site and extent. If the inhibitory system is affected then there will be an unopposed excitatory drive to stretch and extensor reflexes with partial inhibition of flexor reflexes. Spinal reflexes are unopposed due to the complete loss of supraspinal control. Both flexor and extensor reflexes are disinhibited and therefore people may experience both flexor and extensor spasms. Stroking Effect: Stroking the surface of the antagonist muscle may reduce tone in spasticity. The Ashworth scale is the most widely used assessment tool to measure resistance to limb movement in a clinic setting, although it is unable to distinguish between the neural and non-neural components of increased tone. 1 Slight resistance throughout,with no clear catch at a precise angle. Numeric Rating Scale for Leg Stiffness. Baclofen (Inrathecally - High concentration more locally). Baclofen: The most common systemic agent. Baclofen acts on the receptors of excitatory nerve terminals, in particular the 'GABA B G-Protein receptor. Once the baclofen has attached to this G-Protein on the pre-synaptic terminal, potassium channels open while calcium channels close, hyperpolarising the cell. The inability for calcium to enter the cell means the release of glutamate, an excitatory neurotransmitter, is prohibited. Tizanidine: Follows the same mechanism as Baclofen, however attaches to the a2 adrenoreceptor on the pre-synaptic cell membrane. Botulinum Toxin (Botox): Injected locally into muscle. Prevents the excytotic release of acetylcholine at the level of the neuromuscular junction which further prevents release of calcium from the sarcoplasmic reticulum which leads to excitation-contraction coupling. Diazepam (Vallium): Less common. Increases the effect of GABA, an inhibitory neurotransmitter, that is released from inhibitory interneurons which decreases the excitability within the post-synaptic nerve terminal. Dantrolene: Provided orally. Blocks the release of calcium from the sarcoplasmic reticulum within the muscle which prevents excitation-contraction coupling. People with motor weakness after stroke should be assessed for spasticity as a cause of pain, as a factor limiting activities or care, and as a risk factor for the development of contractures. People with stroke should be supported to set and monitor specific goals for interventions for spasticity using appropriate clinical measures for ease of care, pain and/or range of movement. People with spasticity after stroke should be monitored to determine the extent of the problem and the effect of simple measures to reduce spasticity e.g. positioning, passive movement, active movement (with monitoring of the range of movement and alteration in function) and/or pain control. People with persistent or progressive focal spasticity after stroke affecting one or two areas for whom a therapeutic goal can be identified (e.g. ease of care, pain) should be offered intramuscular botulinum toxin. This should be within a specialist multidisciplinary team and be accompanied by rehabilitation therapy and/or splinting or casting for up to 12 weeks after the injections. Goal attainment should be assessed 3-4 months after the injections and further treatment planned according to response. People with generalised or diffuse spasticity after stroke should be offered treatment with skeletal muscle relaxants (e.g. baclofen, tizanidine) and monitored for adverse effects, in particular sedation and increased weakness. Combinations of antispasticity drugs should only be initiated by healthcare professionals with specific expertise in managing spasticity. People with stroke should only receive intrathecal baclofen, intraneural phenol or similar interventions in the context of a specialist multidisciplinary spasticity service. People with stroke with increased tone that is reducing passive or active movement around a joint should have the range of passive joint movement assessed. They should only be offered splinting or casting following individualised assessment and with monitoring by appropriately skilled staff. People with stroke should not be routinely offered splinting for the arm and hand. ↑ Lance JW. Symposium synopsis. In: Feldman RG,fckLRYoung RR, Koella WP (eds). 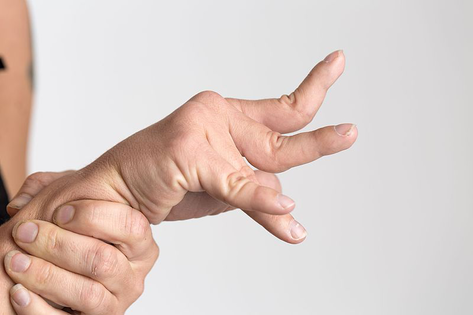 Spasticity: Disordered Motor Control. Chicago, IL: Year Book 1980:485–94. ↑ Pandyan AD, Gregoric M, Barnes MP et al. Spasticity: clinical perceptions, neurological realities and meaningful measurement. Disabil Rehabil 2005;27:2–6. ↑ Lance JW. The control of muscle tone, reflexes, and movement: Robert Wartenberg Lecture. Neurology. 1980;30(12): 1303-13. ↑ Stokes, M. & Stack, E. (2012). Physical Management for Neurological Conditions. 3rd Edition. Elsevier Ltd.
↑ 6.0 6.1 6.2 Kheder, A. and Nair, K.P.S., 2012. Spasticity: pathophysiology, evaluation and management. Practical neurology, 12(5), pp.289-298. ↑ 7.0 7.1 Graham, L.A., 2013. Management of spasticity revisited. Age and ageing, 42(4), pp.435-441. ↑ Ashworth B. Preliminary trial of carisoprodal in multiple sclerosis. Practitioner 1964;192:540–2. ↑ Tardieu G, Rondont 0, Mensch J, Dalloz J-C, Monfraix C, Tabary J-C. Responses electromyographiques a l'etirement musculaire chez l'homme normal. Rev Neurol 1957; 97: 60-61. ↑ Hobart J, Riazi A, Thompson A et al. Getting the measure of spasticity in MS: The Multiple Sclerosis Society Spasticity Scale (MSSS-88). Brain 2006;129(Pt1):224–34. ↑ Valerie L Stevenson, Louise J Lockley and Louise Jarrett, In: Assessment of the individual with spasticity, chapter 2, SPASTICITY MANAGEMENT:A PRACTICAL MULTIDISCIPLINARY GUIDE,Pg-20-21. ↑ Snow BJ, Tsui JKC, Bhatt MH et al. Treatment of spasticity with botulinum toxin: a double blind study.Ann Neurol 1990;28:512–15. ↑ Penn RD, Savoy SM, Corcos D et al. Intrathecal baclofen for severe spinal spasticity. N Engl J Med 1989;320:1517–21. ↑ Smith C, Birnbaum G, Carlter JL et al. Tizanidine treatment of spasticity caused by multiple sclerosis:results of a double-blind, placebo-controlled trial. US Tizanidine Study Group. Neurology 1994;44:S34–42. ↑ Wade DT, Wood VA, Heller A et al. Walking after stroke: measurement and recovery over the first three months. Scand J Rehabil Med 1987;19:25–30. ↑ Morris SL, Dodd KJ, Morris ME. Outcomes of progressive resistance strength training following stroke: a systematic review. Clin Rehabil. 2004 Feb;18(1):27-39. ↑ Manganotti P, Amelio E. Long-term effect of shock wave therapy on upper limb hypertonia in patients affected by stroke. Stroke. 2005 Sep;36(9):1967-71. Epub 2005 Aug 18. ↑ Harlaar J, Ten Kate JJ, Prevo AJ, Vogelaar TW, Lankhorst GJ. The effect of cooling on muscle co-ordination in spasticity: assessment with the repetitive movement test. Disabil Rehabil. 2001 Jul 20;23(11):453-61. ↑ Van der Salm A, Veltink PH, Ijzerman MJ, Groothuis-Oudshoorn KC, Nene AV, Hermens HJ. Comparison of electric stimulation methods for reduction of triceps surae spasticity in spinal cord injury. Arch Phys Med Rehabil. 2006 Feb;87(2):222-8. ↑ RCP (2016). National Clinical Guidelines for Stroke. Available at: https://www.strokeaudit.org/Guideline/Full-Guideline.aspx [Accessed 19th June 2018].